China Glaze Turned Up Turquoise, ORLY Mermaid Tale, China Glaze Flip Flop Fantasy, Sally Girl In Love. Two coats of Turned Up Turquoise and then one coat of Mermaid Tale on the top two thirds. On the feature finger: Two coats of Flip Flop Fantasy and then a coat of In Love on the top two thirds. Okay, so this picture really doesn't capture how bright Flip Flop Fantasy is but, let me tell you, it's incredibly bright, while staying a true pink! (insert sigh of happiness) I couldn't find Flip Flop Fantasy for the longest time and now that I have it, I see why it's been sold-out forever. It's amazing!! However, I HAD to include this picture because of the amazing sparkle! The In Love glitter caught the sun just before it went behind (yet another) raincloud. In all the pictures I've taken of my nails outside, it's has never happened before. Oh, and Mermaid Tale is a freaking stunning mix of blue, teal and green sparkles. It looked awesome in the bottle but even better on my nails. All in all - it was a great nail week! Love the turquoise - and the top coat really pops on it too. Looks beautiful! I agree, it's hard to photograph neons like Flip Flop Fantasy! I love your comment that the sun loves flip flop fantasy as much as you do! Haha! They look awesome! I'm in love with these colors and the glitter makes it even better! 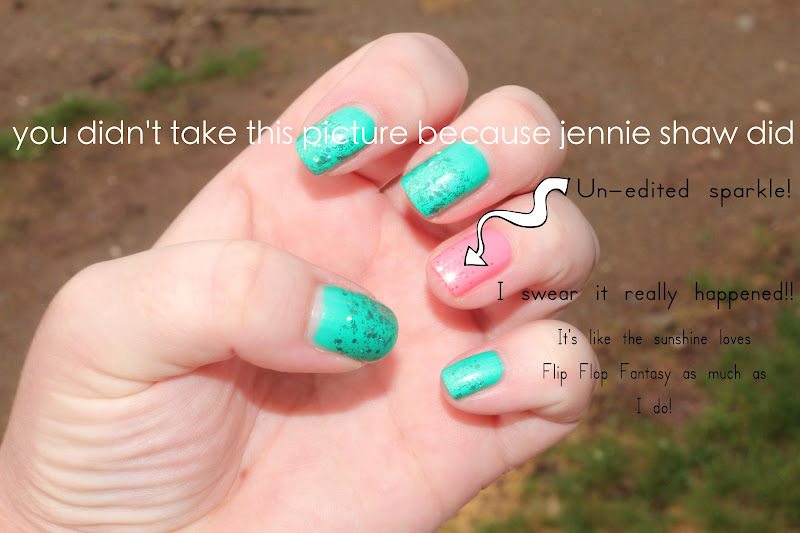 Haha I love the unedited sparkle ;) I just bought flip flop fantasy, and I LOVE it! I also LOVE your watermark. lol. love love love! flip flop fantasy is so hard to get a good pic of! So pretty! I love the turquoise! Flip flop fantasy is SUPER neon! It is hard to capture :( Love the sparkle!